The US ULCC Allegiant Air is stepping outside its typical network framework during late 2016 when it adds service from Newark Liberty International airport, a major hub for United Airlines. Newark, which caters to business and leisure travellers in the New York metro area, is not the typical large city market that Allegiant usually enters. With a few exceptions, Allegiant’s larger markets are heavily weighted toward leisure travellers; its top bases are Orlando Sanford and Las Vegas McCarran. Allegiant is breaking United’s monopoly on three of four routes that it is adding from Newark, challenging United to find ways to respond to the new competition. But Allegiant’s operating profile is different from that of typical ULCCs, which means that United may not be forced to craft any response to Allegiant’s small presence in Newark by YE2016. Allegiant’s decision to enter the New York market was driven by an opportunity emerging after US regulators eased operating restrictions at Newark. It is an easy, low-risk way for Allegiant to test the waters in larger markets while largely sticking to its niche formula of linking small to medium-sized cities to large leisure destinations. Earlier in 2016 the US FAA eased operating restrictions by opening up more hourly slots at Newark – an airport where United holds a 69% share of system wide seats – after determining that congestion at the facility had reduced in recent years. Prior to the FAA’s decision to loosen operating restrictions, Allegiant and several other smaller low cost airlines had complained to the US DoT that United, American and Delta were driving up fares in the New York market by holding the majority of slots at the areas airports (according to the Associated Press). Once it launches flights from Newark, Allegiant will become the first ULCC (defined as unit costs excluding fuel of USD6 cents or lower) serving Newark. Both Frontier and Spirit offer flights from New York LaGuardia. But Allegiant’s operating profile has changed slightly over the past three years as consolidation among the large US global network airlines has created opportunities for Allegiant to spread its model to a larger number of medium-sized cities. For example, in 2014 Allegiant highlighted that Cincinnati – a hub that Delta has significantly downsized – was one of the fastest-growing markets in the company’s history. Other medium-sized markets that Allegiant has added during the last couple of years include Columbus, Ohio and Austin, Texas. Although only approximately 16% of Allegiant’s 344 routes have competitive overlap as of late 2016, its competition with legacy and ultra-low cost airlines has steadily increased. Allegiant’s own analysis from Aug-2016 to Jun-2016 shows increases in route overlap with legacy, low cost and ultra-low cost airlines. In late 2016 Allegiant plans to introduce two weekly flights from Newark to each of Savannah, Georgia; Asheville, North Carolina; Cincinnati, Ohio; and Knoxville, Tennessee. With the exception of Cincinnati, which is also operated by Delta, United has a monopoly on all of the new routes from Newark. Delta Air Lines serves Asheville, Knoxville, Savannah and Cincinnati from its hub at New York LaGuardia. Delta and jetBlue serve Savannah from JFK, and Delta also operates services between JFK and Cincinnati. Depending on the aircraft Allegiant deploys in its new routes from Newark, its seat levels could approach United’s offerings in some of the markets – aside from the larger routes from Newark to Cincinnati and Savannah. It will be interesting to see if United drops its fares to Allegiant’s levels, which will be as low as USD40 at launch. In a still low fuel cost environment United may be tempted to match fares, but Allegiant’s threat in the Newark market seems benign. Allegiant’s entry into Newark is markedly different from Virgin America’s 2013 debut with flights from Newark to San Francisco and Los Angeles; these were two strategic routes and high-yielding for United. United responded by initiating a significant capacity increase on Virgin America’s routes from Newark, and at one point concluded that Virgin America had undercut fares by 20% in those markets. It would be surprising if United Airlines acted in a similar manner with Allegiant’s entry into Newark on smaller routes where United holds a monopoly. For Allegiant, its low frequency service is a low-risk method for testing the waters – assessing how its model performs in a congested and large, competitive US metro market. Allegiant also operates flights from the fragmented market of Los Angeles International airport to Honolulu and numerous other small to medium-sized markets, as well as competing with the “Big 3” in several markets from the airport. 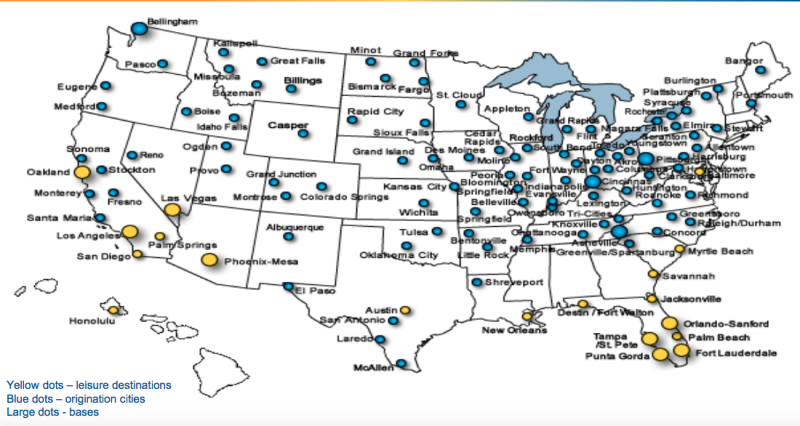 Allegiant is adding two additional new markets in late 2016: Denver, Colorado and Ogdensburg, New York. The service from Ogdensburg to Orlando Sanford and Fort Lauderdale is designed to target Canadian travellers willing to drive across the US border for lower fares. Allegiant administers that strategy in other markets, including Bellingham, Washington. Spirit also operates flights from Plattsburgh, New York to target Canadian travellers from Montreal. Ogdensburg is 99km south of Ottawa, and the Ogdensburg airport has recently expanded its runway to accommodate narrowbody jets. Now is a curious time to attempt to attract Canadian travellers; the depreciation of the CAD against the USD could result in cross-border demand not being as robust. But with a low-frequency operation, Allegiant can also likely attract enough local traffic to justify its flights from Ogdensburg. Allegiant is adding flights from Denver to Montrose, Colorado, which is the nearest airport to the popular ski area of Telluride, Colorado. The service is Allegiant’s first flights from Denver, a hub for United and the headquarters of the ULCC Frontier. United also offers flights between Denver and Montrose and in that market United is likely to price match, given the route’s pure leisure bent. But Allegiant is breaking United’s monopoly, so the final result should be a better fare proposition for the consumer. Allegiant is seizing on a unique opportunity in Newark to bring its different ULCC strategy to one of the most competitive markets in the US. The move also reflects the reality that even a pure niche player such as Allegiant can only avoid the major US population centres for so long before attempting to determine if its model can translate into more competitive markets where incumbent airlines could be more prone to strike back. For now, unlike other low cost airlines, Allegiant with its truly niche ultra-low cost, low frequency model does seem to operate under the radar of the large major US airlines. Newark, in some ways, is an important test case of whether that logic will ring true in the future.